Tuesday Nov 1st 1881 I had my work done up by nine oclock and Aunty Walker and Hatt spent the day here. I was busy sewing all day on sheets for Hatt. Did my practicing in the evening. Weather pleasant. 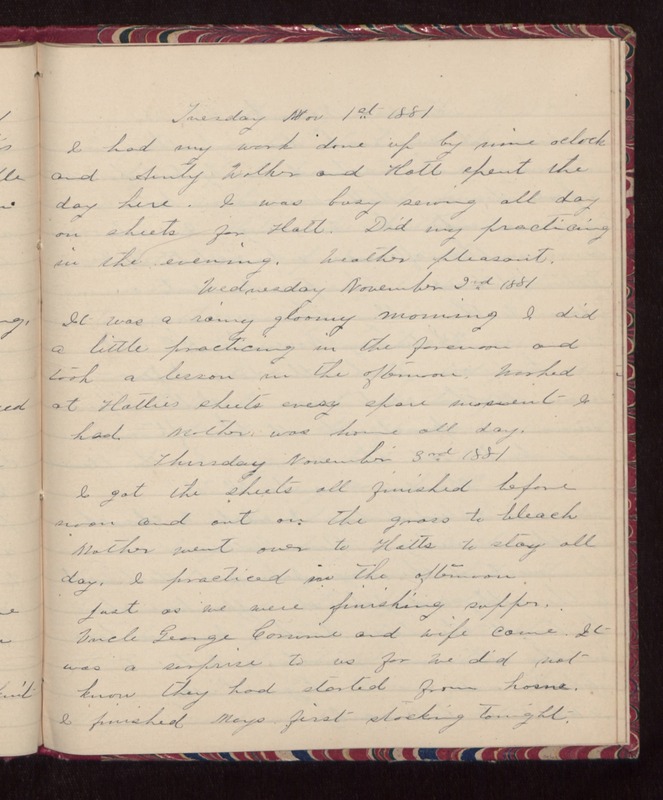 Wednesday November 2nd 1881 It was a rainy gloomy morning. I did a little practicing in the forenoon and took a lesson in the afternoon. Worked at Hatties sheets every spare moment I had. Mother was home all day. Thursday November 3rd 1881 I got the sheets all finished before noon and out on the grass to bleach. Mother went over to Hatts to stay all day. I practiced in the afternoon. Just as we were finishing supper, Uncle George Corwine and wife came. It was a surprise to us for we did not know they had started from home. I finished Mays first stocking tonight.